OMG…this stew is amazingly good and ridiculously easy. 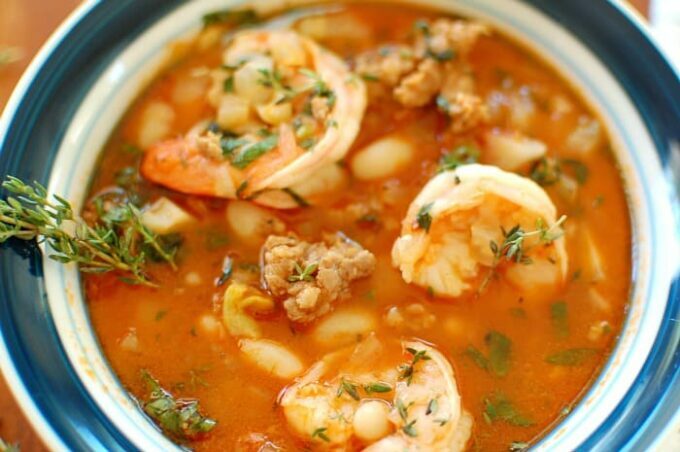 You should put down what you are doing right now, and go to the store and buy the ingredients to make this Shrimp and Sausage Stew for dinner tonight! With good bread and a glass of white wine, you’ve got a great meal for your family or for entertaining. 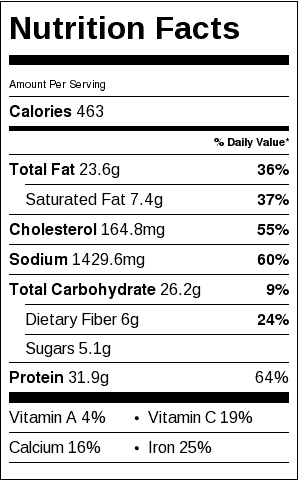 MaryJo went to Costco last week and brought home a bag of wild caught Gulf shrimp, the 21-30 size. And in a fit of Suzy Homemaker-ness, that same day she cooked a bag of dried Great Northern beans and froze them in recipe size portions. 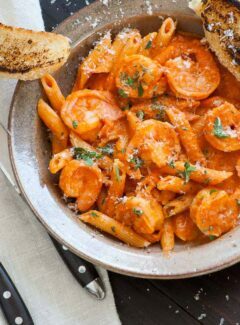 When I saw Giada De Laurentiis make this on Food Network TV, I realized I had almost everything I needed to make this dish. It’s easy and fast to make and the taste is sensational. Chop and saute some garlic, a fennel bulb, and shallots in EVOO, add in some good Italian sausage and cook till the meat is brown. 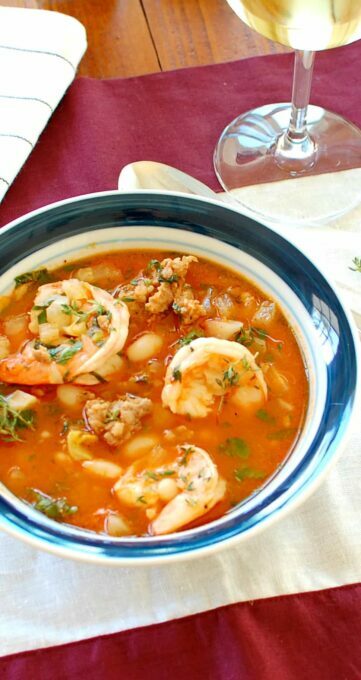 Throw in some dry white wine, tomato paste, chicken broth, some herbs, the shrimp, and white beans and you’ve got a reason to skip going to a restaurant and invite your friends over for dinner. We all agreed that this is an excellent recipe. 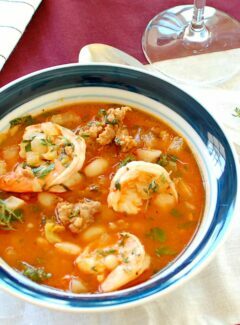 Shrimp and sausage stew is definitely going to be made on a regular basis at our house! 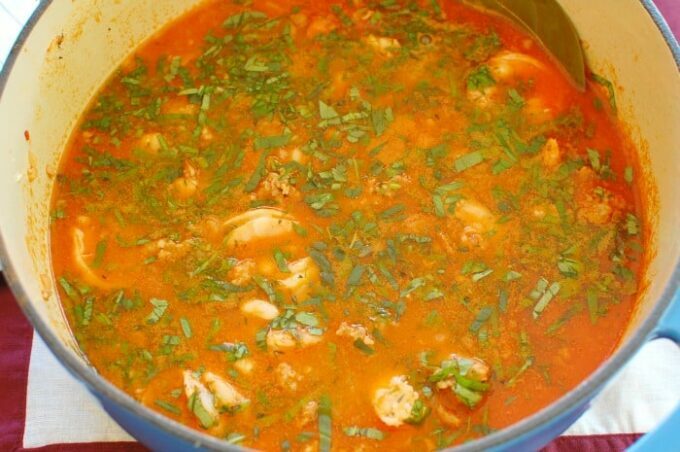 This is the best tasting stew having tons of flavors complementing each other and it is so easy to make. Heat the oil over medium-high heat in a large heavy pan. Add the fennel, garlic, and shallots and cook, stirring occasionally with a wooden spoon, until the vegetables are softened, about 10 minutes. Add the sausage and break it up with the spoon. Cook until the sausage is brown, about 5 minutes. Add the wine and use the spoon to get up any browned bits from the bottom of the pan. Stir in the tomato paste, chicken broth, and bay leaf and bring to a simmer. Uncover the pan and add the shrimp, beans, basil, and thyme. Simmer, uncovered, until the shrimp are pink and cooked through, about 4 minutes. Discard the bay leaf. The broth Is to die for! . I followed the recipie exactly as written, and use a very good bottle of wine. Perfect!!!! 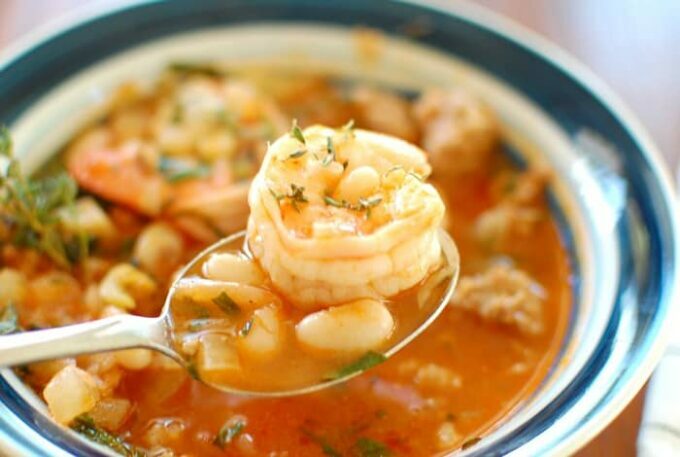 Thanks Anthony…Shrimp and Sausage Stew is my go to recipe when I want something really good. Mary Jo and I have it at least once a month. Oh yes….. Giada !!! Pleasing to watch her cook. I saved this pin several weeks ago because it looked so good. I made the stew last weekend. Simply, it’s a keeper. Easy to make… easier to enjoy. Heat from the Italian sausage was perfect spice. Never used fennel before, enjoyed that. Added a little more sausage because I bought a lb. Other than that I followed the recipe. Leftovers were just as good one day or two days later. Make it for your family and friends…. they’ll think you’re a gourmet cook. And, you will be. Thanks for trying the recipe and the nice comment Bob. I love this soup! 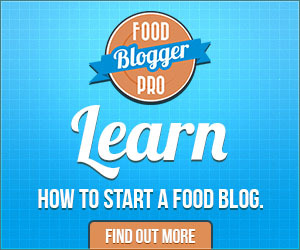 I stumbled across your website on pintrest and spent most of the weekend finding recipes to try! Please keep doing what your doing. Even my picky husband couldn’t stop dipping in the soup pot. Although I knew that I was going to like the stew, I was surprised at how much I love it! 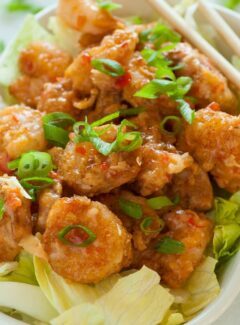 The flavors are so spot on and I’m sure that–had there been any leftovers–it would have been even better the next day. Next time we’ll make a double recipe!